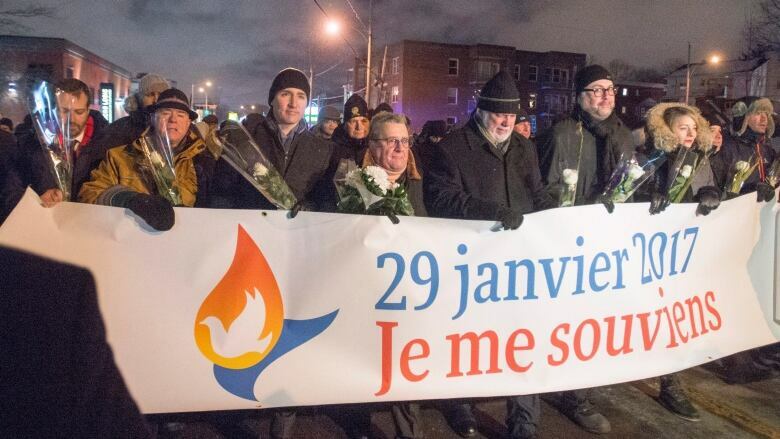 A weekend of commemorative events across Quebec to mark the anniversary of last year’s fatal mosque attack in Quebec City was capped by Monday evening’s tribute to the victims near the site of the massacre. 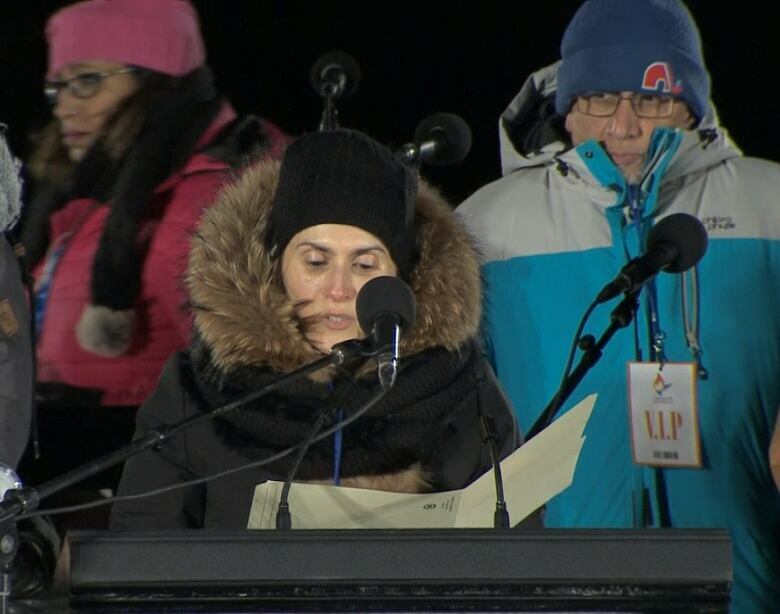 More than a thousand people in Quebec City braved a bitter cold Monday night to stand in solidarity with the six Muslim men who were killed in a local mosque last year. The candlelight vigil came after four emotional days of commemoration events marking the first anniversary of the shooting. It was held in a church parking lot near the mosque, the same place where people gathered for a spontaneous outpouring of sympathy hours after the shooting last January. But widows and survivors did what they were unable to do then: take the stage and speak publicly about their pain. "I'm using this opportunity to tell you to take advantage of each moment of your life, to savour each moment with your family, to tell them you love them," said Louiza Mahammed-Said, a mother of three who lost her 41-year-old husband, Abdelkrim Hassane, in the attack. "Life is so short and unpredictable. Every January 29th, I hope that we'll remember the victims." Aymen Derbali, shot seven times when he attempted to distract the shooter, took the stage in his electric wheelchair. The vigorous applause he received from 1,000 pairs of hands wearing gloves and mitts sounded like thundersticks. 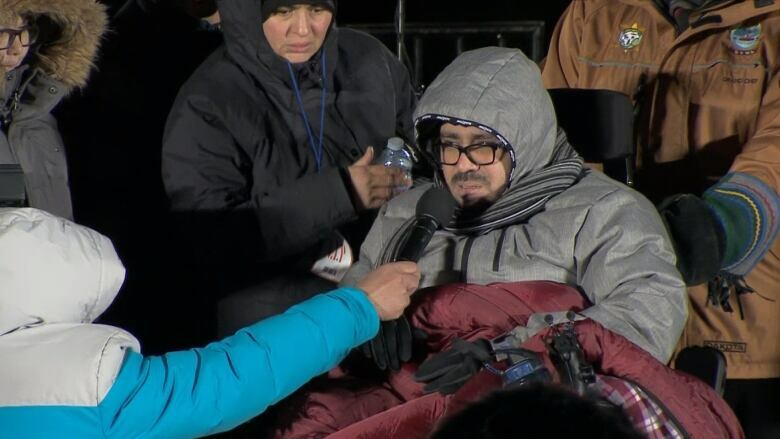 "Beyond the tragedy, we really saw the nature of Quebec and Canada — their generous natures, their good hearts," Derbali, now quadriplegic, said as an organizer held a microphone for him. "The whole [Muslim] community felt it.... We are proud of being Quebecers." He added: "We are all human beings. We have many similarities. The values that unite us are much more important that the small things that differ." The anniversary of the shooting was accompanied in Quebec by debates about whether the attack was simply the work of a "lone wolf" or reflected wider unease with Muslim immigrants. All the large political parties in the province opted not to endorse a campaign to have the anniversary declared a day to combat Islamophobia. Some argued the word is too divisive, others that Quebecers were not Islamophobic. The federal Liberals had also avoided taking a clear stand on the issue. But Prime Minister Justin Trudeau appeared to address it directly in his remarks to the crowd. "Why does the word Islamophobia make us uneasy?" he asked. "As a society we are going to have to go deeper to found out why it bothers us." In his remarks, Premier Philippe Couillard discussed Islamophobia alongside other forms of discrimination. He also urged Quebecers to consider their own origins when criticizing other newcomers to the province. "We all came here from elsewhere to join the First Nations," he said. "It's only the date that changes, and that date does not determine our level of citizenship. Someone is not a better citizen because they have been here for 10 generations versus someone who just arrived five years ago." The speeches were followed by a short walk to the mosque, where many placed flowers, candles and messages of support in the snowbanks outside. A man with a trumpet played Ave Maria as the procession ended. "They were Quebecers who were killed a year ago," said Sylvie Lavoie, who is from the Saguenay region about 150 kilometres away. "They were people who fled countries that were difficult to live in and they came here to live in peace, but that's not what they found here." 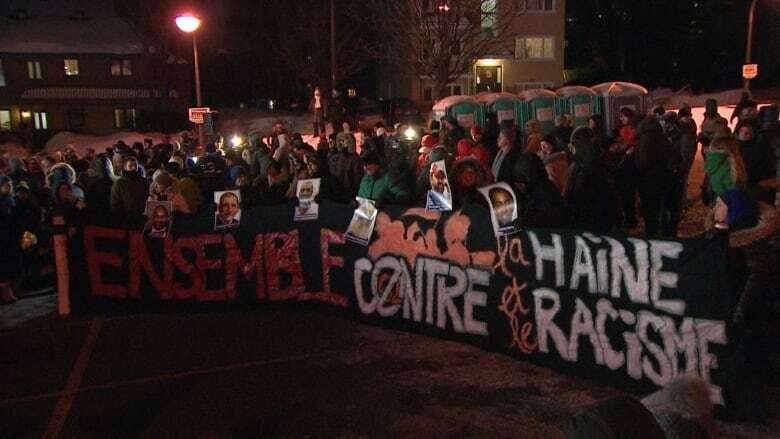 Pierre Chateauvert, a longtime resident of Quebec City, said the tragedy was still too fresh in the minds of many residents for them to face the deeper issues associated with it. "Quebec is a conservative city," he said. "It's changing. But the problems still haven't been solved yet." Several other cities across the country also held events commemorating last year's attack, one of the worst mass shootings in Canadian history. A vigil was held at Ottawa's monument to human rights on Elgin Street. Residents in Toronto marked the anniversary near City Hall. In Victoria, the provincial parliament building will be lit up in green, the colour Muslims associate with paradise, to honour the shooting victims. A group called the #RememberJan29 movement has also launched an online campaign to make this day an annual opportunity to reflect on the tragedy and work to make Canadian society more inclusive.